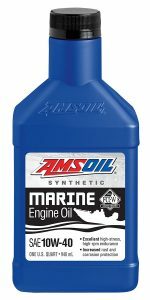 Sterling Aero Marines Services recommends and uses high quality “Amsoil” synthetic marine lubricants in all of their boat and personal watercraft repair and service. Why use Amsoil synthetic Marine lubricants? Most recreational boat owners work full time and have precious little time for boating. To maximize their time on the water they need lubricants that protect their boat engines from wear despite challenging operating conditions. Much like automotive engines modern marine engines are becoming more advanced and tougher on oil. Nearly all new inboard and outboard engines feature computer controlled fuel injection. Four stroke outboard engines are becoming lighter and produce more low-end torque than before. They’ve largely closed the performance gap between two-stroke and four-strokes. Even personal watercraft (Jet-Skis) now all have high performance four-stroke engines and some are even turbo-charged or super-charged! Modern marine engines are characterized by high-rpm operation that can shear the molecular structure of oil and reduce its ability to protect against wear. On average a marine engine propelling a boat at 30 mph operates above 4000 rpm while an automotive engine at 60 mph only operates at around 2000 rpm. The added heat and stress invite wear and deposits. Heavy deposits can cause piston rings to stick. Stuck rings lead to compression loss which reduces power. Stuck rings can also lead to catastrophic piston scuffing. The marine operating environment creates additional challenges for oil. Marine engines are constantly exposed to humid air. The moisture the engine ingests increases the likelihood of corrosion compared to automotive engines. Water cooled marine engines also run at lower temperatures than automotive engines so the moisture does not evaporate as readily. Plus, when the engine is shut down for the day, moist air continues to enter the engine as it cools, increasing the risk for corrosion, especially if the oil doesn’t contain corrosion inhibitors. Amsoil 10W-30 Synthetic Marine Engine Oil, Amsoil 10W-40 Synthetic Marine Engine Oil and Amsoil 25W-40 Synthetic Blend Marine Engine Oil are shear stable formulations that deliver maximum wear protection in four-stroke marine applications. They are formulated with advanced additives to guard against corrosion common in marine environments. Amsoil 25W-40 Synthetic Blend Marine Engine Oil is formulated specifically for Mercury engines that encourage the use of synthetic blend oil in the owner’s manual. Amsoil Marine Specific Two Stroke Formulations. Amsoil synthetic two-stroke marine oils provide outstanding wear protection and low smoke. Amsoil HP Marine Synthetic Two Stroke Oil is excellent in modern direct fuel injected (DFI) engines that generate increased heat and friction compared to their predecessors. It provides increased lubricity for reduced wear during normal operations. It can also be used for lean-mix operations on modern Evinrude ETEC outboards. For pre-mix applications, Amsoil Outboard 100:1 Pre-Mix Synthetic Two Stroke Oil contains a heavy dose of low-temperature dispersant additives that excel at reducing varnish, carbon and deposit formation in water cooled engines. It’s low smoke, low odor and low toxicity properties produce fewer emissions at 100: 1 pre-mix ratios than oils mixed at 50: 1. This benefits the operators, the environment and can also reduce oil cost. Amsoil Marine Gear Lube is designed for outboard lower units and sterndrives on inboard/outboard engines that require a SAE75W-90 gear oil. It is formulated to reduce friction and wear. It helps prevent rust and corrosion, resists foaming and protects components even when diluted 10% by water. Marine engines have to work considerably harder in a harsher environment than their automotive counterparts. They need the extra protection that Amsoil specialty marine lubricants provide. Sterling Aero Marine Services uses and recommends Amsoil marine lubricants and products. Purchase high quality Amsoil Marine lubricants and products by clicking on the appropriate link below. Contact us if you require further information and technical literature.